The Royal Family of Azurth (when there was such a thing), did not have children in the messy way of the common folk. Rather, it was their tradition and prerogative as the chosen heirs of Azulina, who made the Land of Azurth, to call upon the Stork to deliver to them a child. This Stork was no ordinary wading bird of the earthly lands of which you are no doubt familiar, which is the same sort of stork common to the Land of Azurth. 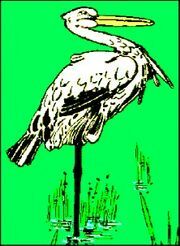 This stork is a fae creature, in ancient times tasked with ferrying souls but allowed the enter semi-retirement after Azulina appointed the royal line of Azurth. The process, described in certain ancient texts once in the hands of the clerics of Iolanthe, but now confiscated, required a summoning ritual to call forth the Stork. Then, the would-be royal parents would negotiate with the great bird and be levied a price based on the number and traits of the children desired. Where the Stork acquired the children was a closely protected trade secret. The price was seldom measured in gold but rather in something highly valuable to the customer, though perhaps no one else. Since the Wizard became ruler of the Land of Azurth, the royal line has ended and the Stork brings no more children. Some scholars believe (and a few royalist agitators hope) that some fugitive Stork-summoning texts may yet be in circulation. There are a number of folk who might pay handsomely for one, if one was located.